In 2003 and 2004, ACS provided El Paso with environmental services for the repair of a natural gas pipeline at the San Carlos River crossing south of US 70 on the San Carlos Apache Indian Reservation, Arizona. El Paso selected ACS based on ACS’ excellent performance on previous El Paso projects, ACS’ broad-based environmental qualifications, and a specific request from San Carlos tribal representatives based on ACS’ previous work on San Carlos Tribal land. 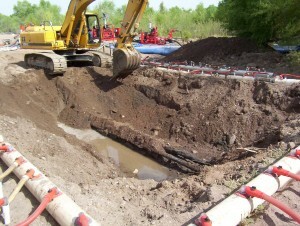 Prior to and after pipeline repair, ACS completed the following tasks: assisted El Paso personnel with Clean Water Act Section 401, 402, and 404 permitting and reporting; conducted an archaeological survey and a biological review; assisted the San Carlos Wildlife and Recreation biologist in determining whether the project area contained suitable habitat for the endangered southwestern willow flycatcher; reviewed construction plans for compliance with Federal Energy Regulatory Commission (FERC) environmental requirements; coordinated prefield meetings between San Carlos and El Paso personnel; coordinated San Carlos access permits with Tribal legal counsel; and ACS field personnel acted as FERC Environmental Inspectors during site work. « Cultural Resource and Biological Review, Pipeline Repair Project, El Paso Natural Gas Corp.